Dance Attitude is a dancing school with two locations; one in Tubize and one in Lillois. This year, the dancing school of Tubize is existing 10 years and they organise a big show in Forest National. 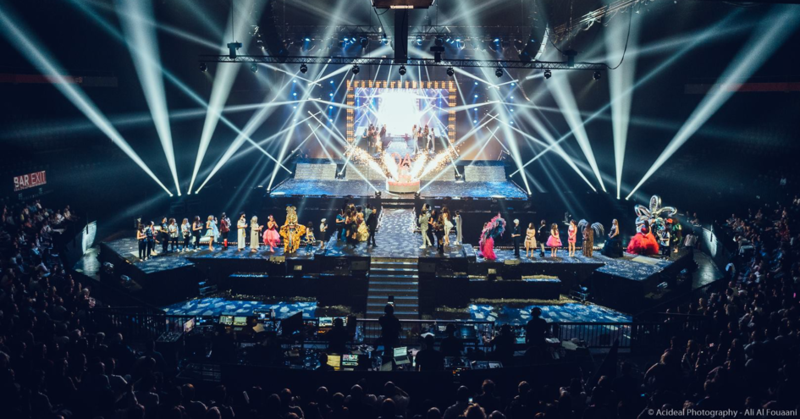 For years, the manager of Dance Attitude, Nicolas, can rely on François Vandermeeren and François Lupant as light and video operators for their annual shows at the end of the year. François Vandermeeren explains: “For this special occasion we used a GrandMA2 installation which includes 2 GrandMA2 Light for light and video, 1 GrandMA2 Ultralight for lighting up the sides, 2 NPU’s and 1 VPU. We choose to work with this installation to work fast and efficient.” The GrandMA2 Light is the perfect tool to control all kinds of lighting genres like conventional lights, moving lights, LEDs, video and media. They both supply an intuitive and fast control of all connected fixtures and channels. Both consoles can handle an almost infinite number of presets, cues, pages, sequences and effects. Over 12 DMX, the GrandMA2 installation manages 24 VL3000 Spot, 34 Mac Aura XB, 40 Mac Aura, 7 Mac2000XB, 24 ClayPaky Mythos, 39 ClayPaky Sharpy, 35 Chromlech Jarag P30, 60 Sunstrip and 30 Molefay. All lighting and audio equipment was provided by Arto.